Swiss wearable brand MyKronoz has announced it will showcase ZeTime, the first fully hybrid smartwatch, at the world’s most prestigious watch show, Baselworld (Stand D31, Hall 2.2). 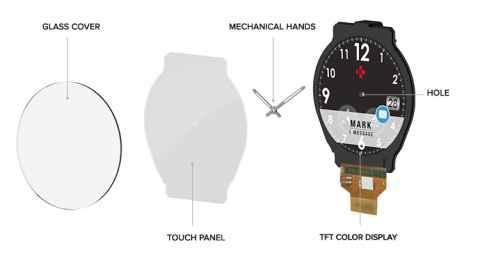 With ZeTime’s unveiling at Mobile World Congress, MyKronoz challenged the industry with groundbreaking technology that enabled a hole to be cut in the center of a round TFT color display allowing mechanical hands to pass through. Designed to be worn all day, every day, ZeTime offers the classic design of a traditional timepiece with the most advanced features of a smartwatch. With ‘Smart Movement’ technology, mechanical hands will function for up to 30 days with a single charge. “With ZeTime, we believe that we’ve designed the first smartwatch with no compromises: combining our Swiss heritage in watchmaking with the best features of a wearable at an affordable price. Bringing it to Baselworld confirms our position as a challenger to both traditional watchmakers and wearable brands. We’re living up to our promise of ‘smartwatches for everyone’ by making ZeTime live on Kickstarter now before going into retail in September 2017,” said Boris Brault, CEO and founder of MyKronoz. This game-changing approach has proven successful for MyKronoz with over two million devices already sold across its range. Now, MyKronoz is launching a Kickstarter campaign for ZeTime to make it available to everyone. Running for 35 days with the goal of raising a minimum of $50,000, backers will be the first to get their hands on ZeTime in summer 2017 at super early bird prices starting from $119 for the stainless steel case and silicon watch band. Backers will also have the opportunity to input into ZeTime’s features including favorite watch face designs and app notifications. For additional information, visit the Kickstarter campaign, here. For those who prefer to wait for ZeTime to hit retail stores, it will be available in September 2017 with an MSRP of $199. A classic take on wearable technology, ZeTime has a sleek stainless steel watch case inspired by the finest Swiss design, along with a variety of interchangeable digital watch faces and straps created to fit every style. With a hole through the center of the round TFT color display, ZeTime has mechanical hands over a full color touchscreen allowing users to see the time even when the smartwatch screen is powered off. The mechanical hands will function for up to 30 days with a single charge and automatically update the time according to the watch’s location, thanks to ‘Smart Movement’ technology. ZeTime runs its own proprietary operating system to allow it to be compatible with both iOS and Android. MyKronoz will be demonstrating working prototypes with responsive touchscreen and mechanical hands of ZeTime at its booth at Baselworld (D31 – Hall 2.2). Additionally, a range of finishings and watch bands for ZeTime will also be on display.